Getting to Niagara Falls from Toronto can be done in a number of ways. Niagara Falls is between an hour and a half and a two-hour drive from downtown Toronto. The QEW is a major six/eight-lane highway that connects Niagara Falls and Toronto. It provides the most direct route between the two cities but is by no means scenic. If you would like a more scenic route, hop off the highway around St. Catherine's and take Hwy 81 through wine country, to discover a beautiful, rolling countryside with a wine route clearly marked. In addition, at Burlington, follow Lakeshore Road, which runs along the Lake Ontario shore, and gawk at all the mansions. From Toronto, you'll follow signs first for the Gardiner Expressway West, which becomes the QEW (Queen Elizabeth Way) West. From Toronto Pearson Airport, take the 427 South to QEW West. In Burlington—about halfway through your drive—veer left to follow signs for QEW Niagara. Finally, about a half hour past Burlington, take the 420 exit on the left. Go Transit operates a year-round combination train/bus route between Toronto and Niagara Falls. Passengers must transfer to a bus in Burlington to continue onto Niagara Falls. From May to the end of September weekend train service between Toronto and Niagara Falls is available with special cars outfitted to accommodate bicycles. VIA Rail offers direct, daily service between Niagara Falls and Toronto. Note that the bus station and the train station are in old Niagara Falls, about a 5-min drive from the Falls themselves. Numerous shuttles take passengers from Toronto Pearson International Airport to Niagara Falls. Note though that flying into Buffalo is another option for visiting Niagara Falls, where a shuttle ride will be less than half the time and cost. Niagara Airbus offers pickups from the airport or downtown hotels. Megabus is probably the cheapest way to get to Niagara Falls from Toronto—other than riding your bike. A guided tour of Niagara Falls may be a great way to see the top attractions in the area and have experts take care of transportation, tickets, etc. 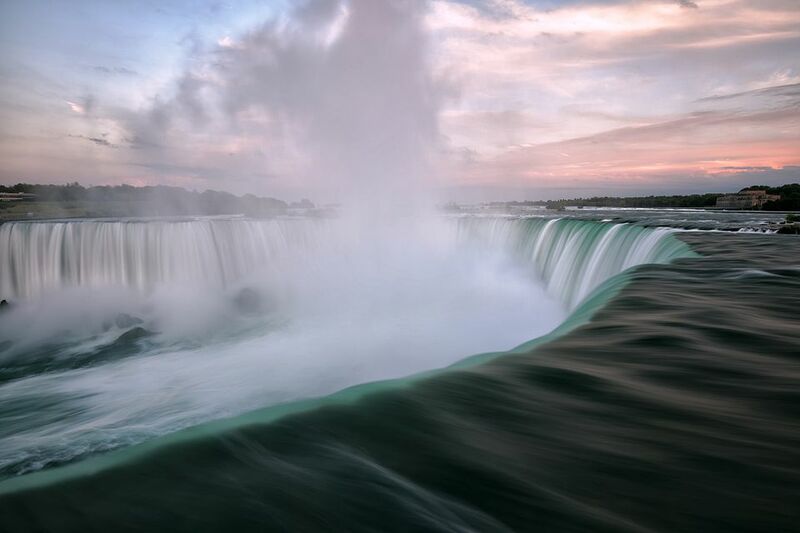 Consider what you want to get from your tour to Niagara Falls before booking. Some questions to ask yourself are: Do you want lots of free time? Do you want to ride the Hornblower Boat Tour (formerly Maid of the Mist)? Do you want to visit a winery? Do you want to visit Niagara-on-the-Lake? Do you want a meal included? Do you want to see the Falls lit up in evening? If you are staying at a Toronto hotel, the concierge will be able to arrange a tour for you. It takes about an hour and a half or two hours to drive between Toronto and Niagara Falls, the most direct route being alongside Lake Ontario on the Queen Elizabeth Highway (QEW). If you have the time, a number of places along the way are worth a visit. Burlington is less than an hour from Toronto along the QEW. If you want to get off the pavement and enjoy some green space, stop at the Royal Botanical Gardens, a designated national historic site that includes 400 acres of display gardens, exhibits, cafe, and shop. It's minutes off the highway. Once past Hamilton, if you would like to take a more scenic route to Niagara Falls, get off the QEW either at Fifty Rd. or Casablanca Blvd. and take Hwy 81 through the towns of Grimsby, Beamsville, Vineland—all part of the Niagara Wine Region. Stop in the town of Jordan to visit Cave Springs, one of the most popular wineries.